Seal launching is like flying, but only to land in water. Its an amazing feeling and it is fun. The seal launch involves sliding or falling off the shoreline and dropping into the river. The seal launch is a fun way to start your day. 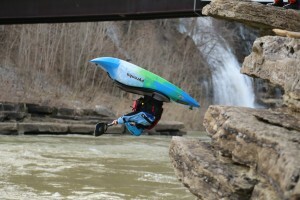 Or playing on rivers with steep banks, and sometimes it can be the only way of getting on the water. For me I think of all the good and bad things that can happen, but most of them are good. I start to talk to myself and tell myself that I am a great boater. Then after that I pray and hope everything goes well and planned. Then I say just do it, about 3 times. Put your boat at the edge or where you need to put the boat before you slide in. Then of course, get in the boat, secure yourself in. Then do step 1. again. And get ready push of the ground, but make sure you are ready to fall or slide. Where you launch off of will determines whether you tuck or don’t tuck. For a drop seal launch, which means to push off a rock and fall in mid air, you want to tuck. If you don’t tuck you face the consequences, which aren’t bad they are just painful. Example is that when you hit the water, it can hurt,depending how high you are above the water. 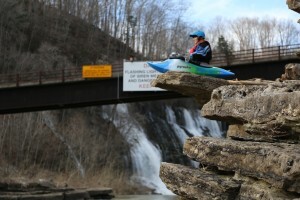 So for that not to happen, when you push off, put you paddle to the side of you and tuck. The next type of seal launch is a slide, meaning to slide of the shore and into the water. If the slide is not steep, you want to lean a little bit forward, but not too much. You want to aim between 2-3 inches past your hips. That way you can keep you speed. If the slide is steep to where you need to hold on to something to keep you from sliding in, or if you lean forward you will slide into the water, you want to lean back about 4-5 inches so your bow is lifted off the ground. That way when you hit the water you glide across. If you don’t lean back, you could possibly hurt your back because when your bow hits the water and it is not lifted, it might catch the water and go under, therefore all the speed you had, comes to a stop. Once you do the steps above step four smile, because you just did an awesome seal launch. If needed and possible, go hike back up to the seal launch and do it again. Once you do the perfect seal launch you will feel accomplished and happy.